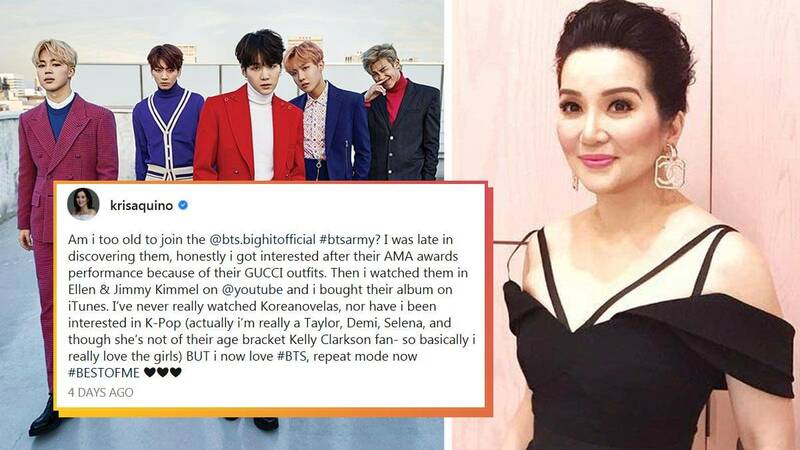 Over the past few days, "Queen of All Media" Kris Aquino has been posting about her newfound love for K-Pop, specifically Korean superstar group BTS. The 46-year-old celebrity took to Instagram to express her fascination with the popular group following their onstage appearance at the recent American Music Awards. The fascination didn’t end there for the self-proclaimed “oldest member of the army.” Just like a true fan, Kris upped her fangirling when she found out the group is sponsoring a UNICEF campaign called #EndViolence. The #kilig is real. Who can blame her?